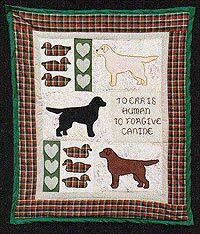 These patterns for quilted wall hangings have simple step-by-step instructions that are easy to follow to completion. 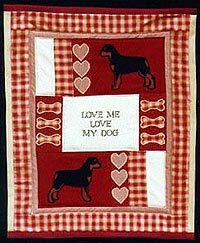 Included in the pattern are full size applique designs, your choice of a variety of favorite "doggy" sayings, full materials list, fabric cutting layout illustrations, plus suggested fabric choices. Finished size is approximately 24 by 30 inches. Even if you've never attempted a wall hanging before, you can do one of these! Machine or hand applique. 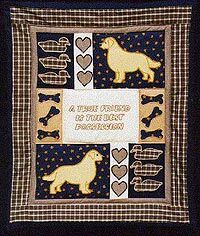 "These patterns for quilted wall hangings have simple step-by-step instructions that are easy to follow to completion. 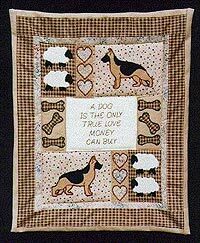 Included in the pattern are full size applique designs, your choice of a variety of favorite ""doggy"" sayings, full materials list, fabric cutting layout illustrations, plus suggested fabric choices. Finished size is approximately 24 by 30 inches. Even if you've never attempted a wall hanging before, you can do one of these! Machine or hand applique. " Item Name: Quilt Block Rooster Pillow Item Number:PO474 This is a great design! Included are cross stitch design instructions for the rooster block. Also there are instructions on fabric requirements, cutting and construction of the quilted/sewing part of the design. 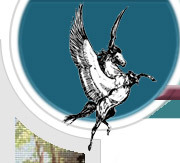 All materials needed are listed conveniently on the back page.